Martha Berry Digital Archive | Letter to Miss Berry from W.E. Browne Decorating Co.
Letter to Miss Berry from W.E. Browne Decorating Co. This is a letter to Miss Berry from the W.E. Browne Decorating Co. saying that they received her check for 500 dollars. They are also thanking her for the remittance. antique furniture, money, W.D. Rusk, W.E. 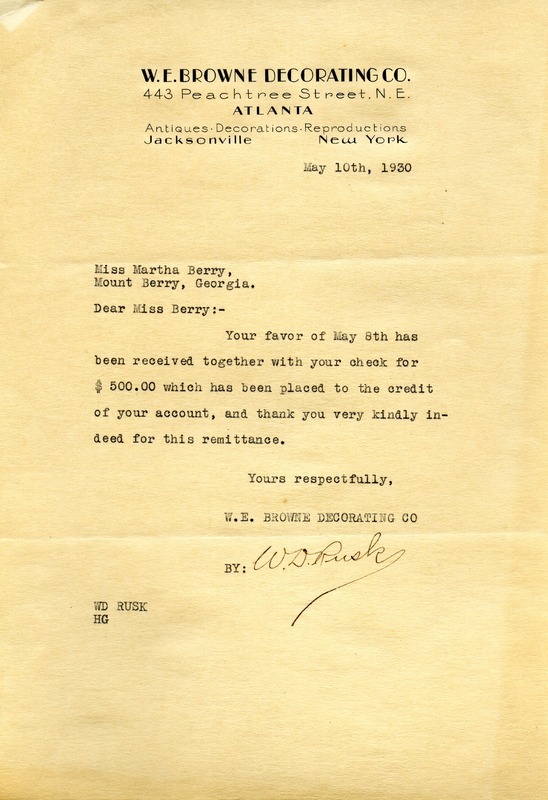 Browne Decorating Co.
W. D. Rusk, “Letter to Miss Berry from W.E. Browne Decorating Co..” Martha Berry Digital Archive. Eds. Schlitz, Stephanie A., Kelsey Wetherhold, Chelsea Risley, et al. Mount Berry: Berry College, 2013. accessed April 22, 2019, https://mbda.berry.edu/items/show/11910.